Coast to coast on the Harley! 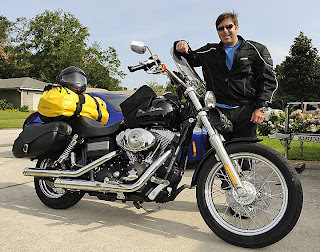 I've been planning this trip for some time... Actually since I was a kid and my best friend Bill Neith helped get me hooked on Harley Davidson motorcycles. Easy Rider was the movie that started my desire to ride a motorcycle from coast to coast. Bill and I would talk about it all the time. That was a long time ago and most childhood fantasies never play out in adulthood. I was determined to make this trip happen. Definitely a "bucket list" item! The freedom and adventure of the road has always fascinated me. I'm fortunate to travel a lot for work, but most of that is via airplane. You miss an awful lot from 35,000 feet up! Now it seems the trip is finally a reality. My brother Don and I are doing it together and leaving July 3rd from CA and riding over 3500 miles to the east coast and hopefully seeing some great sights along the way. We'll be riding from San Francisco through Yosemite to Mammoth Lakes, down through Death Valley into Vegas, over to the Grand Canyon, over to Colorado and the Rockies, down to Santa Fe NM and over to Arkansas and Tennessee, then finally back to FL. I packed up the bike for a test run with my luggage before shipping it to CA where I'll fly out and meet Don at his house. Packing is tough because we have to travel light but still be prepared for all kinds of weather. We also plan to camp along the way a few nights, so tents and sleeping bags are part of the package! 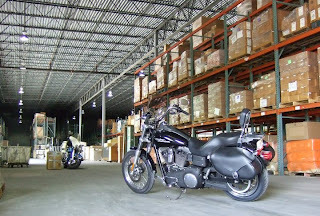 After figuring out how everything fits on the bike it was time to drop it off at the freight warehouse to be trucked to the west coast.